Gun rights backers interpret the 2-1 appellate court ruling as a mandate instructing lawmakers to pass a bill allowing citizens to carry concealed weapons in public with few if any restrictions. CHICAGO — A federal court ruling tossing out Illinois’ ban on concealed weapons might end the last such gun prohibition in the country, but not without an expected fight. 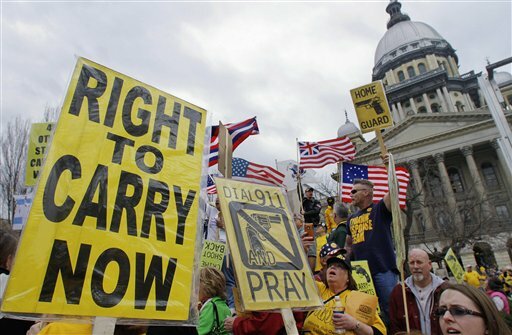 The question is whether the battle will be an appeal to the U.S. Supreme Court, which has been silent on the issue of concealed weapons, or a legislative confrontation over the court’s order that Illinois adopt a law allowing concealed carry with “reasonable limitations” like other states have. Illinois Attorney General Lisa Madigan’s office said she is studying the issue, while gun control advocates quickly urged her to appeal Tuesday’s ruling by the 7th U.S. Circuit Court of Appeals that Illinois’ ban is unconstitutional. But the ban’s defenders said they were more certain of fireworks over a second part of the ruling — an order for the Illinois Legislature to come up with a law legalizing the concealed carry of weapons within 180 days. Exultant gun rights advocates, who long have argued the Illinois ban violates the Second Amendment, couldn’t agree less. They celebrated the ruling as a major victory in their campaign to make Illinois and its ban the center of the national debate over gun control after Wisconsin tossed out its own ban on concealed carry last year. The gun rights backers interpreted the 2-1 appellate court ruling as a mandate instructing lawmakers to pass a bill allowing citizens to carry concealed weapons in public with few if any restrictions. Todd Vandermyde, a National Rifle Association lobbyist, said gun control advocates could forget any limits such as partial bans near places like day care centers and schools. State Rep. Brandon Phelps, who sponsored a restrictive concealed carry bill last year that lost by the slimmest of margins, said that gun control advocates are not going to like the next bill they see on the floor of the General Assembly. Richard Pearson, the executive director of the Illinois State Rifle Association, said lawmakers could quickly pass the Phelps bill when they reconvene the first week of January. The bill, he said, “contains all the things — background checks, classroom time — that all the parties wanted, so it’s ready to go.” But that’s not to say all those provisions will be in the bill this time around, he said. Among the biggest backers of the ban were powerful Chicago Democrats with a long tradition of support for gun control legislation; much of the rest of the state opposed the ban. Democratic Gov. Pat Quinn, an ardent gun control advocate who recently tried to revive a proposal for an assault weapons ban, was still reviewing the ruling, an aide said. One provision in Phelps’ bill that might be taken out, Pearson said, is a requirement for concealed-carry training specific to Illinois residents that is far more rigorous than in some other states, including Arizona and Wyoming, which Pearson said have far less stringent training requirements. Pearson said another possibility is requiring training from any NRA instructor, as some states require. “You get certified and you’re out the door,” he said. There also is likely to be debate over where concealed weapons can be carried. For example, Wisconsin decided that gun permit holders cannot carry weapons in schools, police stations or courtrooms but can carry weapons into taverns — if they weren’t drinking. Private property owners can ban weapons in their buildings if they see fit. Some gun control advocates believe their best chance is with the Supreme Court. It could be a long shot, given the court’s rulings in the last few years — one overturning Chicago’s 28-year-old handgun ban — that citizens have a Second Amendment right to have a gun for self-defense in their homes. At the same time, Flynn Currie, the House Majority Leader, said she is encouraged by the court’s silence on the right to carry concealed weapons, and wants Madigan to appeal the ruling.